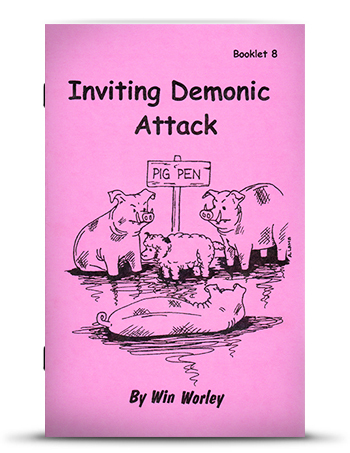 Demons are not able to attack people at will. They must have legal holds, legal grounds or other open doors to justify their entry. Although Satan’s forces are not invincible they sometimes seem so because of our ignorance of the ground rules, all found in the Scriptures. Spirits of Rebellion, Disobedience, Stubbornness and Vanity and Effeminacy are given legal grounds to invade men who grow long hair. This has been confirmed repeatedly in deliverance. This is labeled a shame in the Scriptures. The question invariably arises, “But how long is long?” If a fellow must grow long sideburns, a moustache and a beard to prove he is not a girl, then it is too long. The reverse would be true for females who adopt masculine hair and dress styles. In the Marines, new recruits are shorn of long hair as a preparation to teach them a tightly disciplined life. Teen Challenge workers also have found it necessary to trim men’s hair as a part of rehabilitation therapy. In several cases I know about, the cutting of even a very young boy’s hair resulted in beneficial behavior changes. In Pigs in the Parlor, Frank Hammond tells that all his life he had a tormenting history of allergies topped by chronic hay fever. When he entered the deliverance ministry he quickly discovered that all allergies are demonically energized. He and others in deliverance were puzzled because repeated attempts to free him failed to dislodge the demons. Finally, as he sought the Lord for the answer to the puzzle, God spoke to him about destroying a huge Indian arrowhead collection he had started as a child. When they were destroyed and the curses from them were broken, all the allergy spirits left. There have been no further bouts with the allergy problems. In another case, a collection of owls and frogs (ceramics, pictures, macrame, etc.) was the culprit holding a deadly cancer in place. The lady with the collection had been given a very short time to live and had wasted away to sixty-five pounds. When she was warned about the creatures of the night, she at first resisted the idea of destroying them (Proverbs 1:7). As she got steadily worse, in desperation she cleaned the house of these cursed objects. Prayer in Jesus’ name was then able to rid her of the cancer spirits. She did a spectacular turn around and is quite healthy and well today. In a meeting in northern Wisconsin, I mentioned owls and frogs as objects which should not be in your home. The next night a school teacher came for prayer saying the Lord had convicted her to destroy her extensive collection. When I commanded any spirits connected with the owls to manifest, her mouth dropped open and terrible wails came out. The spirits confessed they were indeed witchcraft demons. They had come in because of the pictures, ceramics and macrames of owls in the house. They were thrown out. Next I found and cast out six or eight chronic illness and infirmity spirits which had been held in by the owl spirits. They had made her sickly and weak for years. Frank Hammond tells of a lady who confessed the sin of mutilating her body (by piercing her ears). She then destroyed her collection of earrings in order to receive a miraculous healing from Bell’s Palsy. Pierced ears have been connected with some severe female problems also. Tattoos come under the same prohibition and open doors for invasion by spirits. In Scriptures, earrings of the pierced variety are associated only with slavery, heathenism and harlotry, scarcely fitting adornment for believers.